The Acer Predator 15 is a solid performer, with strong cooling and phenomenal battery life for a gaming laptop. 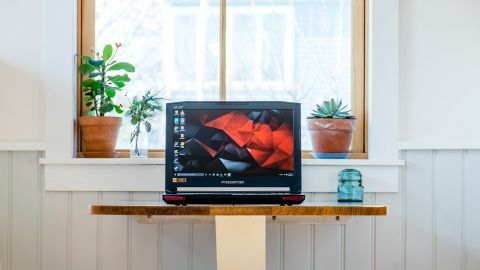 The Predator easily justifies its monstrous stature, being full of features that don't immediately come to mind when thinking of a high-end gaming laptop. Yes, it has tons of hard drive space and RAM. Its Skylake-generation Intel processor is top of the line, and the Nvidia GPU performs wonderfully. But these are perfectly complimented by an impressive cooling system, fantastic speakers and a rugged build that feels like a piece of military equipment. All that bulk is not without merit. This laptop is thick and heavy, yes, but it moves air like no one's business. In fact, it even comes with a modular CoolerMaster FrostCore cooling unit that swaps out with the Blu-ray drive. Better yet, the sound system is phenomenal. The speakers, located on the front of the laptop, are helped along by a subwoofer on the bottom. Both the sound and cooling systems no doubt add to the overall thickness of the laptop, but they both work so well it wouldn't be worth cutting them in exchange for reduction in size. Another contributing factor to the Predator's tank-like aesthetics is its eight-cell, lithium-ion 6,000 mAh battery. The huge-capacity battery is worth the weight, though, as it offers some of the longest battery life in a high-end gaming laptop. The notebook's size means there's also plenty of room for a full-sized keyboard and a large trackpad. The chiclet-style keyboard is one of the most comfortable I've used, with smooth-travelling, solid keys spaced perfectly apart. The right and left mouse buttons on the trackpad have the exact same travel and feel as the keys on the keyboard, a small detail that I didn't realize I wanted until I experienced it first-hand. On top of angles and accents that scream "I am a gamer, and this is my computer," the Predator 15 includes light-up elements no decent gaming laptop would go without. This includes two narrow strips and a backlit logo on the lid, as well as a two-tone backlit keyboard. The arrow and WASD keys are colored red, making them easy to pick out from the rest of the black keyboard. The Predator lacks the colorful customization options seen on many other gaming rigs, which is a bit of a disappointment. The color customization goes as deep as turning off and on different lighting zones throughout the laptop. Personally, I like the ability to change colors on my keyboards, but the reality is I do it once and then forget about it, so it's not a deal breaker. A small, mirrored strip of plastic on the hinge houses the hard drive, battery, and power lights, and shows through even when the laptop is closed. It almost looks like the glowing bar on the front of Knight Rider's KITT, or the row of lights below the viewscreen on the Enterprise. The LEDs aren't animated or anything, but it's a nice use of the space and adds to the futuristic war-machine aesthetic. In addition to the programmable macro keys, there's also a dedicated button directly adjacent to the trackpad that disables it and the Windows key. It's another one of those things I never knew I wanted before, but being able to play Call of Duty in its proper WASD configuration without constantly losing my place, thanks to accidental trackpad contact, is a welcome feature. Pressing it also brings up a quick icon on the screen to let you know it been activated, along with changing the LED on the button from green to red. This soft-touch paint finish is usually a magnet for grease, but the Predator 15 is is extremely resistant to picking up fingerprints or stains. It's actually difficult to leave noticeable fingerprints on any part of the Predator, including the keys and trackpad. Kudos to Acer for creating a gaming laptop that looks good and stays that way without much maintenance.